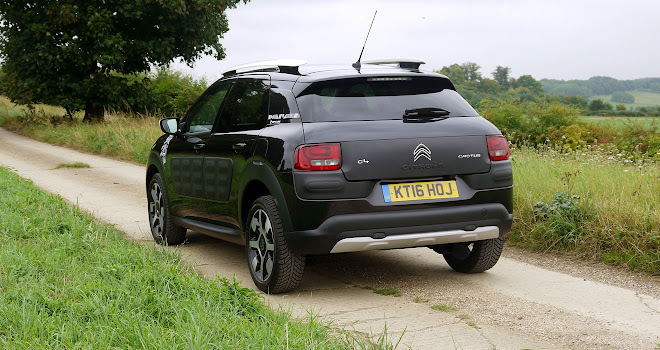 Citroen’s C4 Cactus has been around for a couple of years and if you’ve read my review from the time of its launch you’ll know I’m a big fan. I love its combination of light weight, agile handling, distinctive looks, comfortable cabin and clever design. You can’t miss the bubble-wrap Airbumps, of course, which protect the flanks and corners from carpark mishaps but do make the C4 Cactus quite colour sensitive. 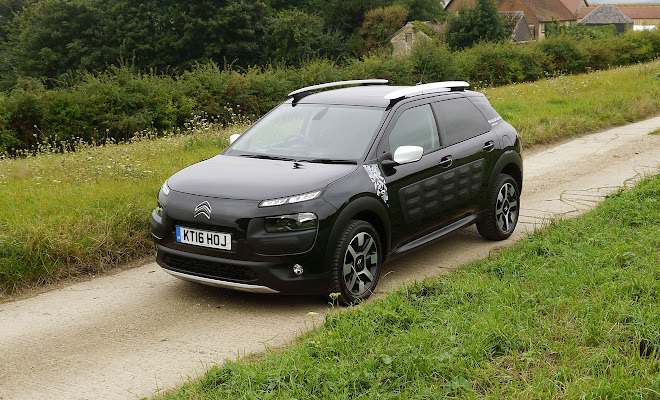 The plastic panels come in four shades: black, grey, chocolate brown and a warm grey called Dune, and Citroen sensibly limits what paint goes with which Airbumps when you configure a C4 Cactus from new. Nonetheless, a pearlescent white Cactus with grey bumps looks a strikingly different car to a metallic purple one with black panels, for example. Reasonably priced to begin with, a used Cactus can look quite tempting whatever the colour. 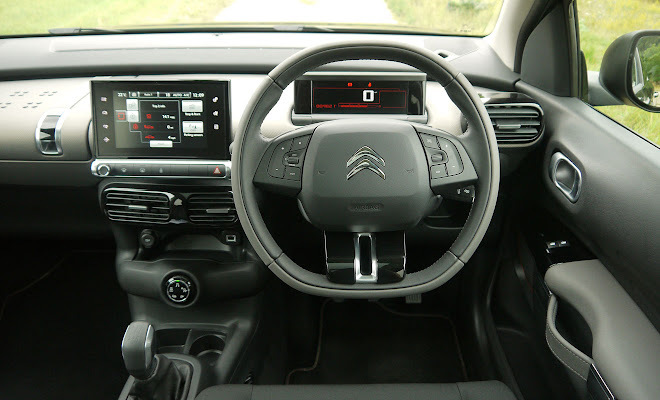 Among the selection of used Citroens offered by Motorpoint, for example, I found a 2015 model with fewer than 6,000 miles under its belt for just £8,699. That arresting price of course buys an entry level spec, but you’ll only need to stretch to around £11,000 to buy a year-old, top of the range 1.6 diesel Cactus in upmarket Flair trim, saving more than a third off the price of a new one. Buyers in the market for a new C4 Cactus, meanwhile, now have an extra option to consider in the shape of the Rip Curl edition. This is not quite the usual stickers-and-trim exercise in window dressing, to liven up a mid-life model. To tie in with its Ozzie surfer branding, the Rip Curl Cactus has gained a little extra capability as a beach buggy. As well as chunky all-season tyres on its 17-inch alloys, the Rip Curl edition features a selectable Grip Control function. 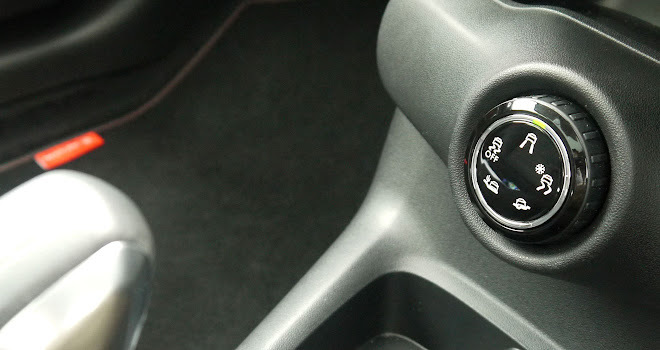 Accessed via a dial jutting out above the centre console, Grip Control operates in five different traction modes and uses the car’s ESP system to detect and correct for wheel slip. There is of course your Standard mode, suitable for tarmac and reasonable weather. Sand mode activates a simulated differential lock, keeping both wheels turning to ensure the Cactus will chug along on a shifting surface at up to 75mph. Mud mode is similar, allowing only a limited amount of slip between the two driven wheels to offer better power delivery over boggy or uneven surfaces. In extremes, it can send 100% of torque to just one wheel. It works at up to 50mph. Snow mode will limit the torque sent to the wheels to help the tyres find purchase without spinning a scattering of snow into ice and slush. It switches off above 30mph. And finally there’s an ESP Off setting that also works only up to 30mph, which seems to be designed for showing off in car parks. I might be wrong about that last one. While I did find some grass to drive briefly onto, I can’t vouch for the effectiveness of these various modes, given the absence of any mud, sand or snow in the vicinity. 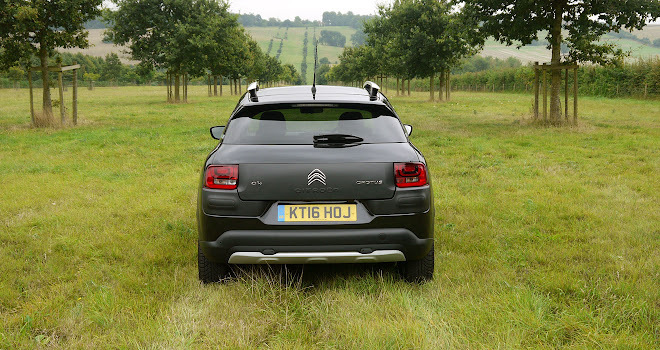 It’s probably important to remember that the C4 Cactus is not a 4x4 – it is front-wheel-drive only. That said, the chunky tyres will probably do more to provide sure footing than the average bystander would imagine. You’d most likely need to act like a complete clot to get stuck on a beach. 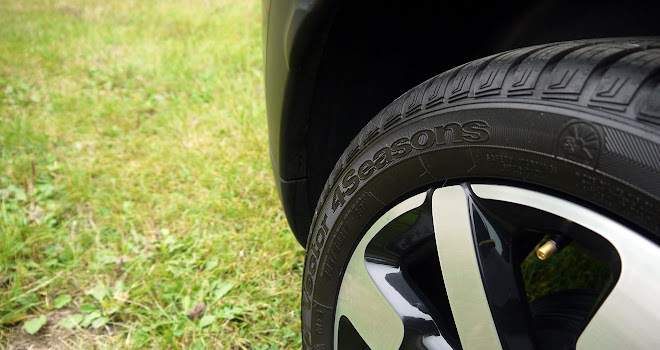 Happily the four-season tyres don’t spoil the ride, and the Cactus retains its easy loping agility. The 1.2-litre 3-cylinder petrol engine I tried offers plenty of puff – enough to reach 62mph in 9.3 seconds – though the long-throw five-speed manual gearbox could probably benefit from an extra cog rather than the intergalactic fifth gear as fitted. The CO2 rating is a reasonable 100g/km, with no nasty diesel emissions to feel guilty about. As well as its tyres and modes the Rip Curl Cactus comes with a panoramic glass roof, white roof rails and mirror caps, mock aluminium bash plates front and rear, and some doubtful branded stickers on the sides. 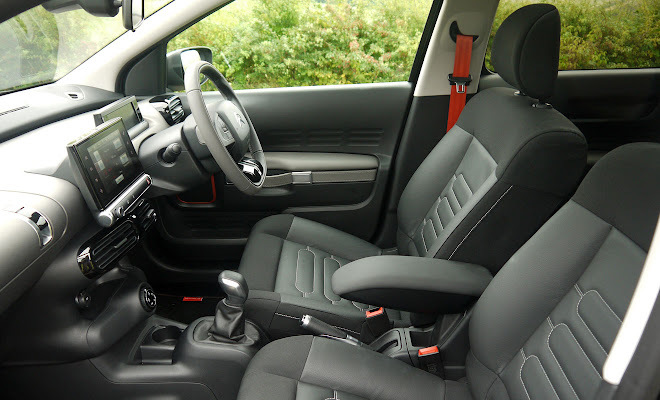 Inside, there are splashes of orange on the seatbelts, mats and speakers. Parking sensors and a rear camera, climate control, satnav and a six-speaker stereo are probably of more interest, however. 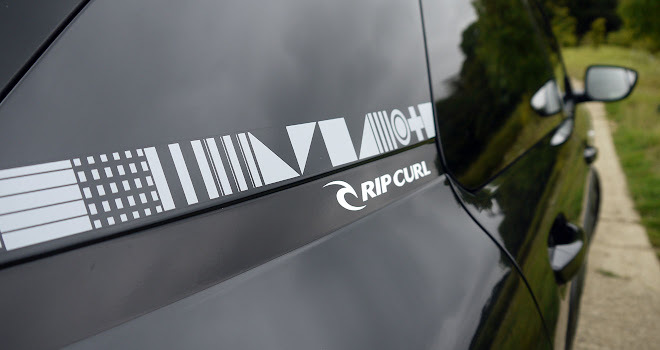 Available only with the top-spec 110bhp diesel or petrol engines, the Rip Curl edition costs from £18,840. I’m not entirely convinced that the Rip Curl’s tweaks add much to the car’s basic appeal, unless you really do venture off the beaten track from time to time. If it were me, I’d venture off and find a nearly new standard petrol Cactus.